Cerro Mercedario is the highest peak of the Cordillera de la Ramada range and the eighth-highest mountain of the Andes. It is located 100 km to the north of Aconcagua, in the Argentine province of San Juan. It was first ascended in 1934 by Adam Karpiński and Wiktor Ostrowski, members of a Polish andinist expedition led by Konstanty Jodko-Narkiewicz. The Polish party erected a cairn on the summit. In 1968, after several attempts by some of the strongest Argentine climbers, a Japanese group led by Saburo Yoshida accomplished the first ascension of the south side. In 1971 an Austrian expedition led by Fritz Moravec and Othmar Kucera, climbed the north side. In 1972, Italians Sergio Job Gino and Antonio Beorchia Nigris climbed the Mercedario through the normal route and discovered some Inca ruins just below the summit. In January 1975 an Italian expedition led by Antonio Mastellaro managed to climb the east side. In 1983 a small expedition from Gorizia was able to traverse the south-west ridge, which is considered the most difficult trail of the mountain, and one of the last mountaineering issues in the Andes. On January 27 Mauro Collini, Sergio Figel, Mario Tavagnutti and Rudi Vittori reached the top. ^ The elevation given here is estimated from SRTM data, which shows that the frequently quoted elevation of 6,770m is too high. ^ a b "Argentina and Chile North: Ultra-Prominences" Peaklist.org. The prominence value given here of 3,333 m is based on a summit elevation of 6,700 m for this peak. Retrieved 2011-11-20. 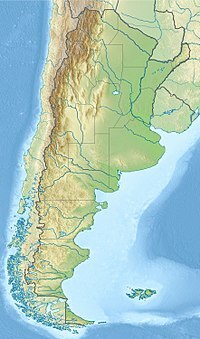 This article about a place in San Juan Province, Argentina is a stub. You can help Wikipedia by expanding it. This page was last edited on 26 January 2018, at 00:08 (UTC).